Frank Mir, is an American mixed martial artist. Mir is a former UFC Heavyweight Champion and a former Interim UFC Heavyweight Champion. He currently holds the record for most victories and submissions in the history of the UFC heavyweight division and is also the only man in UFC history to win a bout by a toe hold submission. 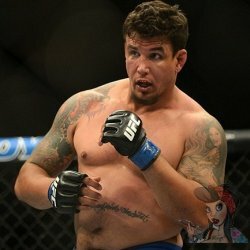 Mir has the record for most UFC fights in the Heavyweight division. As of February 26, 2014, he is #10 in UFC's official heavyweight rankings. Early in his career, Mir sported his name on his right arm and “Two Bodies Many Minds One Spirit” across his stomach. He later went on to get Asian characters on the back of his arms (which he later surrounded in a flame design), but we’re not totally sure what they mean (rumor has it that one or both of them mean “one with endless energy and stamina” or a similar translation). Finally, he got the hug piece on his back that includes his name, a Kanji symbol, and what appears to be dueling samurai. All of his ink is well done, and other than his over-usage of his own name, they’re all pretty cool, especially the intricate back piece. 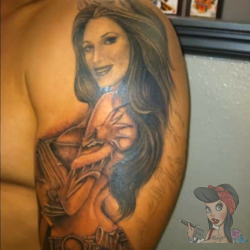 He also has a large portrait of a woman on his other arm.